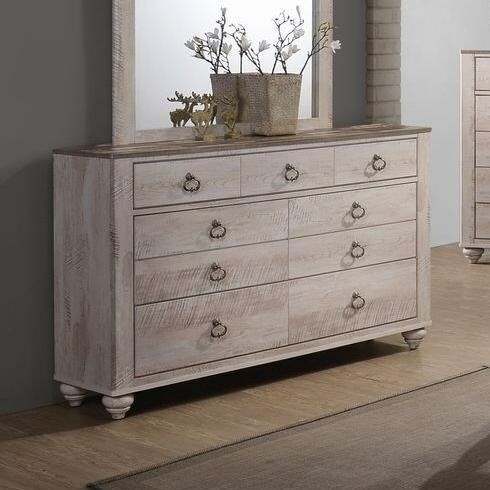 Blending design styles, this dresser offers plenty of storage with seven spacious drawers. The dresser has a clean frame and drawer faces while a distressed two-tone finish, ring hardware, and bun feet add plenty of character. Pair with the headboard and footboard bed and the other storage pieces from this collection for a stylish and functional set of bedroom furniture. The C7302A Casual Seven Drawer Dresser with Ring Hardware by Lifestyle at Furniture Fair - North Carolina in the Jacksonville, Greenville, Goldsboro, New Bern, Rocky Mount, Wilmington NC area. Product availability may vary. Contact us for the most current availability on this product.